Our local PhunkyFoods Engagement and Development Coordinator for Carlisle, Gill Douglas, had a wonderful day at Cummersdale Primary School last week. Kicking off with the whole school in attendance Gill introduced the importance of a healthy breakfast using the PhunkyFoods Bag-A-Breakfast themed assembly. 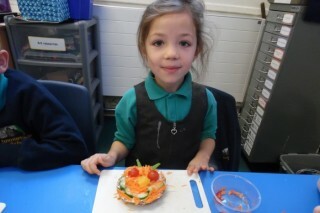 Next came Year 1 and 2 to do some hands-on food preparation where they linked their topic of space with our Phunky healthy breakfast idea and made space-themed bagel faces! Look at this terrific healthy work of art below! Gill had a fabulous time with you guys at Cummersdale Primary - so thank you for inviting her in and we hope you enjoyed the day as much as she did.